A large fire at an electrical substation at the Walnut Creek BART Station Saturday evening temporarily knocked out commuter service between the Rockridge and Pleasant Hill stations, according to BART and fire officials. Marianne Favro reports. 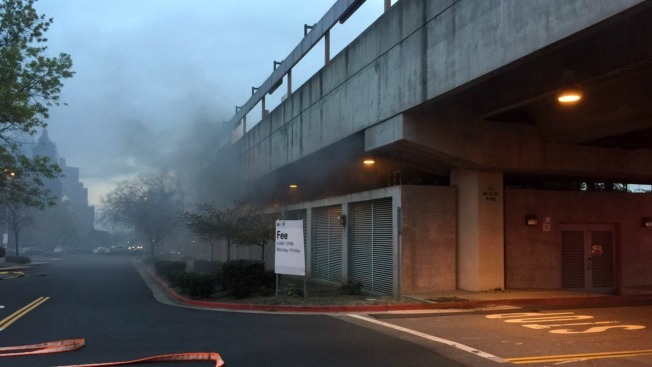 A large fire at an electrical substation at the Walnut Creek BART Station Saturday evening temporarily knocked out commuter service between the Rockridge and Pleasant Hill stations, according to BART and fire officials. The fire, which was reported at 5:49 p.m., did not put any BART riders in the area in danger, but it did force roughly 400 passengers on a nearby train to stay put until the scene was under control, fire officials said. Passengers spent roughly two hours trapped on the train with only emergency lighting above their heads and no restrooms at their service. "They also told us at some point, because we had been on there for quite awhile, if children needed to relieve themselves, go ahead parents and take them to one of the empty cars and they could go ahead and do that," BART rider Michelle Tan said. "A few people did that." Fire crews initially had to wait for BART electricians to arrive on scene before dousing the flames because electricity was surging through the substation. That electrical room helps power trains in the area, but the fire caused significant headaches. "Trains couldn't move between Lafayette toward Concord and Bay Point or Pleasant Hill, and the trains that were in Concord or Pleasant Hill couldn't make it to Lafayette or Rockridge or into the city so the trains were all completely shut down for that period of time," Robert Marshall from the Contra Costa County Fire Department said. Firefighters controlled the blaze around 6:30 p.m., and service was restored just after 7:30 p.m., according to BART. Despite the ordeal, Tan said her fellow passengers handled the situation as best they could. "Everybody (was) really calm," she said. "(BART did) a great job communicating with us."